I want to continue a series I left off in 2012, so this is Part 10 in the series previously titled Plyometrics, Ground Contact Time, and Sprinting. The topic is morphing as each topic brings on several sub-topics. Part 1 Plyometrics, Ground Contact Time, and Sprinting was simply to demonstrate the faster the movement, the shorter the ground contact time. Part 2 covered How to Weight Train without Weights and it focused on speed strength. Part 3 was Driving Resistance Band Training with a video from Remi Korchemny. Part 4 discussed the 5 different types of “strength training”. Part 7 , 8, 9 was Advanced Plyometrics for Jump and Sprint Training and Ballistic Power for Better Athletic Performance and a video on How to Teach Bounding written by Kenta’ Bell, a two time Olympian in the Triple Jump. The ability to produce large amounts of force in as quick a possible time is paramount to all power-speed sports. 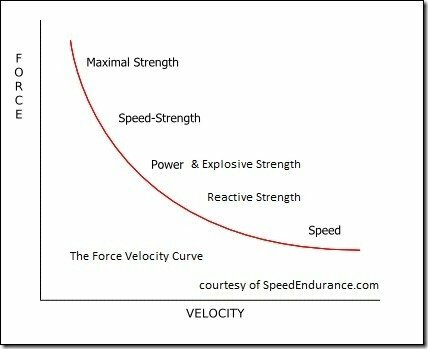 With this in mind, strength and conditioning coaches design programs and exercises that they hope will lead to optimal improvements in this quality – indeed, almost all monitoring tools (force platforms, vertical jumps, Olympic lifting maximums, etc) test almost exclusively the ability to produce force. What is often over-looked is the body’s ability to resist (yield) large amounts of force – force that is ever-present in all of these power-speed sports (sprinting, for example – a sport that has no external resistance whatsoever – bar gravity and air – exerts forces of up to five times body weight in less than 1/10th second upon ground contact); in fact, before an athlete can apply any force whatsoever, he must first yield to the constant forces that are acting upon him (namely, gravity, inertia, and the specific forces unique to his sport); without developing the abilities required to efficiently endure these forces, the body will not (an cannot) apply the types of forces it is otherwise capable of. It is for this reason that we spend a significant amount of time within our strength-training program developing the ability to resist force – the ability to DEcelerate, rather than ACCelerate. This ability has been given many terms in the literature, including coupling time, amortization phase, plyometric ability, and stiffness. For our purposes, we prefer to define it as ‘eccentric strength’. Traditional programs will often include exercises that employ slow eccentrics or ‘accentuated negatives’ within their loading schemes; often, though, this is quite haphazard in its application, and there is little understanding of how it is used within the structure of the yearly training plan and how it can best be employed. Eccentric-dominant exercises (those that begin with the eccentric movement – thereby requiring specific control of the eccentric phase, in the knowledge that the weight must be returned to its starting position volitionally – i.e. using force; for example, back squat, single-leg squat, bench press, etc.) are the cornerstone to any successful strength program. Within our system, we tend to focus more on abilities that involve controlling the eccentric portion of these exercises earlier in the training year (traditional eccentrics, bar and band eccentrics, accentuated negatives, and various forms of isometrics). As the season progresses, the available time in which we work to control these forces is reduced, and the focus involves less the eccentric control, and more the eccentric speed. This work nicely mirrors that of our specific training, which involves moving at greater velocities as the season progresses (whether it be through specific programming or just the improvement in speed qualities through training, or both). READ 1996: How did Donovan Bailey Keep Cool after 3 False Starts? Emphasis on eccentric speed requires that the athlete perform exercises that require deceleration from either high velocity or high force (or both) as quickly and efficiently as possible. Traditional exercises have included depth landings; while within our system, we employ a multitude of weighted variations. 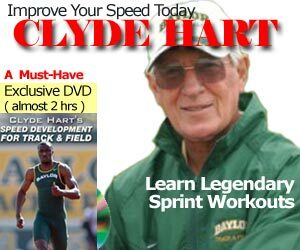 Visit Stuart’s website at http://www.mcmillanspeed.com/. Well this mechanism which many people are talking about. Russians made first observations. You friend Kenta bell is basing all his theory on this form of force education, but nobody dare yet to come with some scientific theory or physiological explanations… I’d dare one, but… it is the water wet!? Thanks for the article !!! Measuring this function of eccentric control is what I find challenging. I have used the 30m flying bounds for number of touches + duration(secs). But have not found numbers in the literature. Do you know of any? I have seen your table that shows distance vs. number of jumps related to 100m time. Jump training with adequate strength to control the eccentric load is essential. I see many youth athletes that under “plyometric” training with inadequate strength foundation performing high volume training. A set-up for injury, as I see in my PT office.